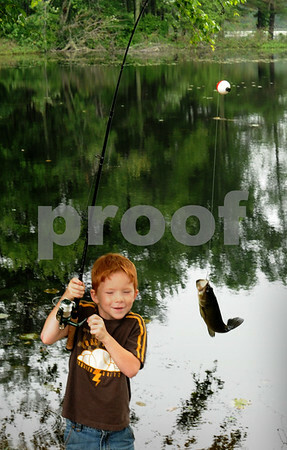 Amesbury: Jacob Trzcienski, 6, pulls in a bass just 5 seconds after casting at Tuxbury Pond on Tuesday afternoon. The youngster, from Dracut, is staying with his family at nearby Tuxbury Pond Campground. Bryan Eaton/Staff Photo Newburyport News Tuesday June 30, 2009.